This article covers what you need to know about digital audio files. I’ll tell you the difference between lossy and lossless files, I’ll explain why bit rates matter (or don’t), and I’ll help you understand the various file formats you may encounter. When you buy a CD, the audio on the disc is uncompressed. You can rip (or import) CDs with iTunes or other software, turning the CD’s audio into digital audio files to use on a computer or a portable device. In iTunes, you can rip in two uncompressed formats: WAV and AIFF (other software allows for other formats). Both formats simply encapsulate the PCM (pulse-code modulation) data stored on CDs so it can be read as audio files on a computer, and their bit rate (you’ll learn what the bit rate is below) is 1,411 kbps. You may see other audio formats too, though they are less common. These include Ogg Vorbis, Monkey’s Audio, Shorten, and others. Some of these codecs are lossy, and some are lossless. However, if you use iTunes and Apple hardware, you’ll only encounter WAV, AIFF, MP3, AAC, and Apple Lossless, at least for music. 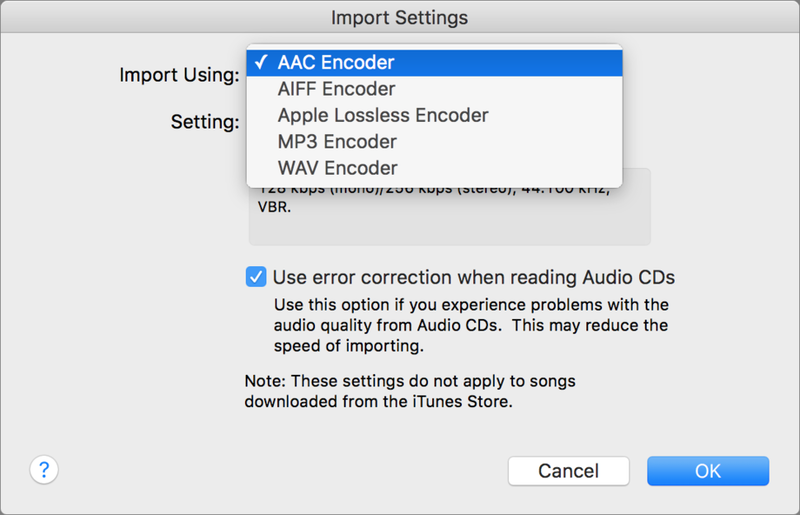 iTunes can rip or import audio files in these formats. Choose the one you want to use in iTunes > Preferences > General > Import Settings. When you rip or convert an uncompressed audio file to a lossless format, and then play that file, it is a bit-perfect copy of the original (assuming the data was read correctly from a CD). As such, you can convert from one lossless format to another with no loss of quality. When you rip to a lossy format, however, if you convert the file later to another format, you lose some of its quality. This is similar to the way a photocopy of a photocopy doesn’t look as good as the original. Some people prefer lossless formats because they reproduce audio as it is on CDs. Lossy compression is a compromise, used to save space, allowing you to store more music on a portable device or hard disk, and making it faster to download. However, most people can’t tell the difference between a CD and a lossy file at a high bit rate, so if you’re ripping your music to sync to an iPhone, lossless files are overkill. Lossless rips are a good way to make archival copies of your files, since you can convert them to other formats with no loss in quality. And you can have iTunes convert them automatically to AAC files when you sync. See this article for more on this automatic conversion, as well as other questions about lossless files. The best way to judge the quality of an audio file—relative to its original, not to its musical or engineering quality—is to look at its bit rate. Audio file bit rates are measured in thousands of bits per second, or kbps. I mentioned above that a CD contains audio at 1,411 kbps, and when you convert that audio to a lossy file, its bit rate is much lower. A higher bit rate is better, so a 256 kbps MP3 or AAC file is better than a 128 kbps file. However, with lossless files, this isn’t true. The bit rate of a lossless file depends on the density and the volume of its music. Two tracks on the same album, ripped to a lossless format, may have bit rates of, say, 400 kbps and 900 kbps, yet when played back, they both reproduce the original audio from CD at the same level of quality. Lossless compression uses as many bits as needed, and no more. Here are two albums I converted to Apple Lossless. You can see the bit rates vary from 353 kbps to 845 kbps. The first album is a chamber ensemble, and the second solo piano. The complexity and volume of the music affect the final bit rate needed for lossless compression. If you’re ripping music to a lossy format, it’s good to choose the iTunes default of 256 kbps, unless you need to cram a lot of music onto your portable devices. If you’re ripping audiobooks or other spoken word recordings, you can use much lower bit rates, since the range of the human voice is quite narrow. Audiobooks are often ripped at 32 kbps, and they sound fine. High-resolution audio, once a niche format, has gotten a lot of press recently. Neil Young’s beleaguered PonoPlayer raised awareness of this type of digital audio. Strictly speaking, high-resolution audio is distributed in files that are “better” than CD quality. High-resolution audio is defined by certain numbers: the bit depth of files, and their sample rate. CDs contain 16-bit audio at a sample rate of 44,100 Hz. So high-resolution audio has a bit depth and/or sample rate that exceeds that of the CD specification (known as the Red Book standard). Much high-resolution audio is 24-bit, 96 kHz, often abbreviated as 24/96. Some companies sell files at 24/192 and 24/384. And there are also several types of DSD (direct-stream digital) files, which use a different recording method. DSD is used on SACDs, or Super Audio CDs, a format designed by Sony and Philips that is pretty much deceased. iTunes showing information about a high-resolution audio file. 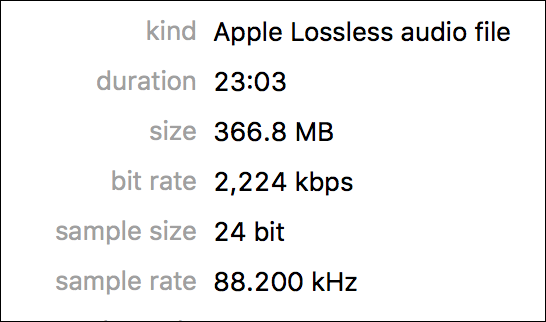 You can see that the bit rate is much higher than for a standard lossless file. What iTunes calls the sample size is the bit depth. A good example of music with a very broad dynamic range is Mahler’s third symphony. Listen to the final movement, and you’ll hear some very soft sounds as well as an extremely loud crescendos. Or listen to Led Zeppelin’s “Stairway to Heaven;” it starts with a soft acoustic guitar and builds up to a fuzz-box finale. A higher bit depth allows music to have a wider range of volume from its softest to loudest passages. But with a lot of contemporary music, the volume of the music is “compressed” to make it louder. (This is dynamic range compression, not the compression used to make files smaller.) So you don’t hear much of a difference with that type of audio if the bit depth is higher. Better numbers don’t mean that the music necessarily sounds better. 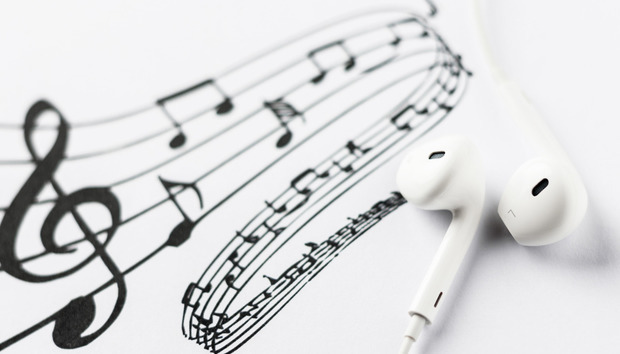 To many people, high-resolution audio is simply a marketing ploy, a way of getting listeners to buy their favorite music in yet another format. It is conceivable that people with very expensive stereos in rooms treated to provide excellent sound may hear the difference, but those one percent of music listeners shouldn’t sway others into buying music that doesn’t sound any different. And when you’re listening on a portable device, the quality of your headphones, and the ambient noise, ensure that you certainly won’t hear anything different. All this makes it seem like listening to music should depend on numbers. But it shouldn’t. Listen to the music you like, in the format that’s most convenient, on the device you want to play it. It’s great to have better headphones and speakers, but great music can cut through all the fancy hardware and move you no matter how you listen to it.